There has been rapid progress in interventional cardiology in recent years, most especially in valve surgery. What used to be possible only with open-heart surgery is now performed using percutaneous technique. Ten years ago, elderly patients with symptomatic severe aortic stenosis or mitral regurgitation (MR) who were considered high risk for surgical intervention were refused surgery. Life expectancy was reduced, especially if such lesions occurred with coronary artery disease or impaired left ventricular function. In the last decade, however, a technical revolution with new devices and better quality imaging has transformed the lives of patients who are poor surgical candidates. The quality of life of such patients has been improved with percutaneous repair. Transcatheter aortic valve implantation for severe aortic stenosis or medical device (MitraClip) for severe mitral regurgitation (MR) is now feasible. Predominantly, elderly patients now have an option to improve their quality of life and live longer. The techniques are gradually being introduced for patients who are not considered to be high risk for surgery. Hence, the number of patients for percutaneous valve procedures is expanding. Interventional cardiologists and cardiothoracic surgeons are teaming up to an improved approach to treat valvular heart disease. The anatomy of the mitral valve is complex and will not be dealt here. Normal mitral valve function requires thin, mobile leaflets with unrestricted commissures, chordae tendineae, and papillary muscles. Dysfunction may result if there is a primary defect in these structures; it can also occur as a consequence of dilatation of the left heart chambers. The symptoms of dysfunction are due to pulmonary venous congestion, atrial arrhythmia, and reduced cardiac output. In mitral stenosis, percutaneous balloon valvuloplasty is now the favored therapy whereas regurgitant valves have only been amenable to surgical treatment – until recently. Abbott Vascular's MitraClip has recently gained much attention for the treatment of severe degenerative MR in patients at high surgical risk. The Alfieri stitch (“bow-tie procedure or edge-to-edge mitral valve repair) is a surgical technique used to treat severe MR. A suture is placed between the anterior (A2) and posterior (P2) segments of the mitral valve resulting in two mitral valve orifices [Figure 1]. The central portion of the anterior and posterior mitral leaflets is approximated with a stitch to create a double orifice with reduced leaflet excursion and less regurgitation. Edge-to-edge repair of the mitral valve has emerged from a surgical concept to a percutaneous transfemoral transcatheter mitral valve repair system. A group of scientists, cardiac surgeons, and interventional cardiologists were impressed by the simplicity of the Alfieri technique. They recognized that it offered the potential to perform a percutaneous, catheter mitral repair for dysfunctional mitral valves. They, therefore, teamed up to design a system that could be used percutaneously. The company was bought by Abbott in 2009 and after various clinical trials developed the MitraClip. In 2013, the FDA approved its use for patients who suffered from degenerative mitral valve regurgitation and who were considered too high risk for surgical repair. It has been approved for use in Japan where the standards of care treatments for MR are limited to open-heart surgery and medication. It is hoped that the device will be indicated to treat both degenerative MR and functional MR. 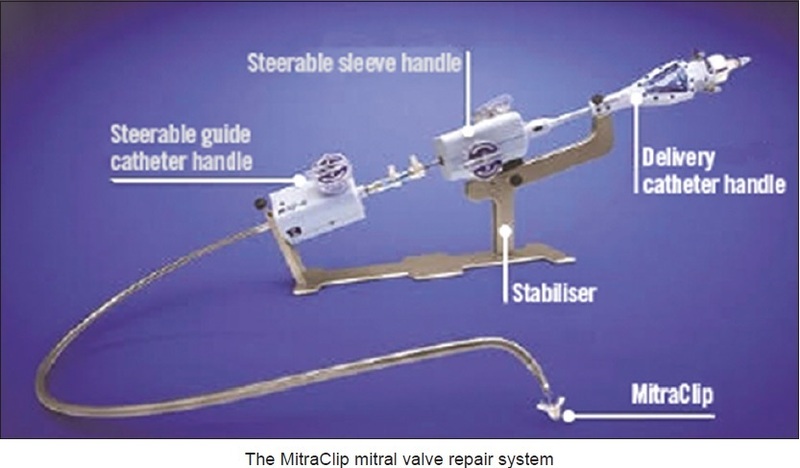 The MitraClip system has been investigated in multiple national and international registries (ACCESS-EU, GRASP, MARS, MitraSwiss, STS/ACC TVT, SENTINEL, and TRAMI).,,,,,, At the present time, patients undergoing the MitraClip repair suffer from symptomatic functional MR with left ventricular dysfunction. Only less frequently, patients with degenerative mitral valve regurgitation and high surgical risk have been included. Several smaller studies have been performed to improve the technical approach and to understand the pathophysiology behind the beneficial effects of the mitral valve repair.,,, The procedure has been proved to be safe, and most patients show improvement of functional capacity. To date, >50,000 people have been treated by MitraClip in nearly 50 countries. The effect in favor of MitraClip for rehospitalization was also consistent in patients with functional MR only and among all subgroups except for patients with ischemic etiology and those with both left ventricular end-diastolic volume <200 and >200 mL. How does the MitraClip device compare with standard mitral valve replacement? Which is more effective in treating MR? Surgery patients experienced superior decreases in MR grade compared to MitraClip patients. However, although surgery appeared more effective in treating MR, PMVR was also effective and safer in a large number of patients, and MitraClip implantation was associated with lower rates of myocardial adverse event. Not all aspects of mitral valve dysfunction can be remedied with the MitraClip. Although it can improve leaflet coaptation, it does not address problems with the mitral annulus as can be done surgically by suturing a ring to provide annular stabilization. Neither can it remedy problems with the chordae tendineae. Several smaller studies have been performed to improve the technical approach and to understand the pathophysiology behind the beneficial effects of the mitral valve repair.,,, The procedure has been proved to be safe, and most patients show improvement of functional capacity. The cause of MR can be complex, making the job of the interventionalist using the MitraClip system difficult to handle and implant. In August 2017 in the Lancet, Praz et al. presented results of the novel PASCAL transcatheter mitral valve repair system which has been investigated in a multicenter, prospective, observational, first-in-man study. Twenty-three patients suffering from symptomatic, severe functional, degenerative, or combined functional and degenerative MR were included. All patients were discussed in the heart team. Patients were denied surgery due to high risk. Most patients furthermore showed anatomical obstacles, which made an interventional approach using the MitraClip system impossible. Implantation of the device was successful in all patients. In 6 patients, a second device has been implanted. Two patients suffered from procedural complications, and three patients died during the 30-day follow-up. The authors present a functional improvement, comparable to that seen in other studies of patients who underwent transcatheter mitral valve repair. Although data from a variety of sources demonstrate that the MitraClip is less effective than surgical mitral valve repair in MR, it remains a safe alternative. 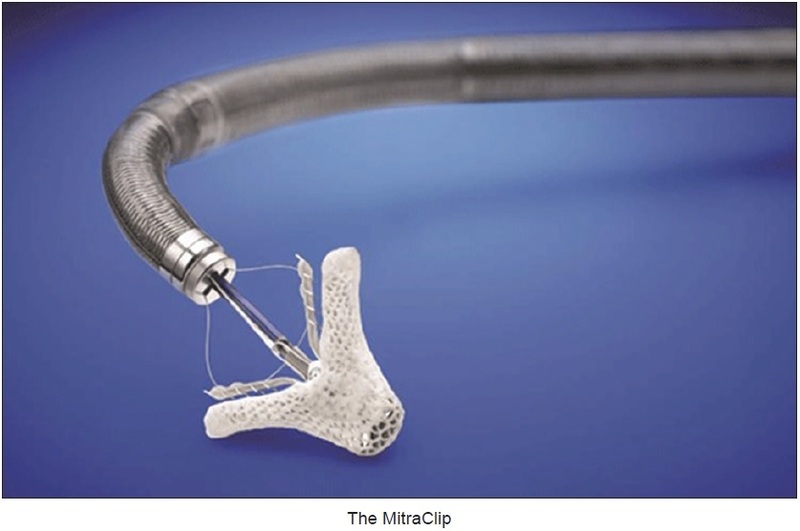 Already, the MitraClip has been deemed safe in patients who are high risk and who are poor operative candidates. Its use can improve both the degree of MR and symptoms in the majority of patients. New technologies are emerging for transcatheter repair of valvular diseases. Transcatheter mitral valve repair is in its infancy, and as the technology advances, we will see more refinement of these devices. Transcatheter valvular repair is a good addition to the growing options available to patients who cannot undergo surgery due to high risk. Further studies are necessary to teach us which approach and which device to use. Available from: https://www.healio.com/cardiology/learn-the-heart/cardiology-review/topic-reviews/alfieri-stitch. [Last accessed on 2019 Mar 22]. Available from: https://www.en.wikipedia.org/wiki/MitraClip. [Last accessed on 2019 Mar 22]. Maisano F, Franzen O, Baldus S, Schäfer U, Hausleiter J, Butter C, et al. Percutaneous mitral valve interventions in the real world: Early and 1-year results from the ACCESS-EU, a prospective, multicenter, nonrandomized post-approval study of the MitraClip therapy in Europe. J Am Coll Cardiol 2013;62:1052-61. Grasso C, Capodanno D, Scandura S, Cannata S, Immè S, Mangiafico S, et al. One- and twelve-month safety and efficacy outcomes of patients undergoing edge-to-edge percutaneous mitral valve repair (from the GRASP Registry). Am J Cardiol 2013;111:1482-7. Nickenig G, Estevez-Loureiro R, Franzen O, Tamburino C, Vanderheyden M, Lüscher TF, et al. Percutaneous mitral valve edge-to-edge repair: In-hospital results and 1-year follow-up of 628 patients of the 2011-2012 pilot European sentinel registry. J Am Coll Cardiol 2014;64:875-84. Puls M, Lubos E, Boekstegers P, von Bardeleben RS, Ouarrak T, Butter C, et al. One-year outcomes and predictors of mortality after MitraClip therapy in contemporary clinical practice: Results from the German transcatheter mitral valve interventions registry. Eur Heart J 2016;37:703-12. Sorajja P, Mack M, Vemulapalli S, Holmes DR Jr. Stebbins A, Kar S, et al. Initial experience with commercial transcatheter mitral valve repair in the United States. J Am Coll Cardiol 2016;67:1129-40. Yeo KK, Yap J, Yamen E, Muda N, Tay E, Walters DL, et al. Percutaneous mitral valve repair with the MitraClip: Early results from the MitraClip Asia-pacific registry (MARS). EuroIntervention 2014;10:620-5. Sürder D, Pedrazzini G, Gaemperli O, Biaggi P, Felix C, Rufibach K, et al. Predictors for efficacy of percutaneous mitral valve repair using the MitraClip system: The results of the MitraSwiss registry. Heart 2013;99:1034-40. Gajjar M, Yadlapati A, Van Assche LM, Puthumana J, Malaisrie SC, Davidson CJ, et al. Real-time continuous left atrial pressure monitoring during mitral valve repair using the MitraClip NT system: A feasibility study. JACC Cardiovasc Interv 2017;10:1466-7. Utsunomiya H, Itabashi Y, Kobayashi S, Rader F, Hussaini A, Makar M, et al. Effect of percutaneous edge-to-edge repair on mitral valve area and its association with pulmonary hypertension and outcomes. Am J Cardiol 2017;120:662-9. Rammos C, Zeus T, Balzer J, Kubatz L, Hendgen-Cotta UB, Veulemans V, et al. Percutaneous mitral valve repair in mitral regurgitation reduces cell-free hemoglobin and improves endothelial function. PLoS One 2016;11:e0151203. Rassaf T, Balzer J, Zeus T, Rammos C, Shayganfar S, Hall SV, et al. Safety and efficacy of deep sedation as compared to general anaesthesia in percutaneous mitral valve repair using the MitraClip system. Catheter Cardiovasc Interv 2014;84:E38-42. Rassaf T. The cardiologist's way to do the Alfieri stitch: Transcatheter mitral valve edge-to-edge repair revisited. J Thorac Dis 2017;9:4832-4. Giannini C, D'ascenzo F, Fiorelli F, Spontoni P, Swaans MJ, Velazquez EJ, et al. Ameta-analysis of MitraClip combined with medical therapy vs. medical therapy alone for treatment of mitral regurgitation in heart failure patients. ESC Heart Fail 2018;5:1150-8. Magruder JT, Crawford TC, Grimm JC, Fredi JL, Shah AS. Managing mitral regurgitation: Focus on the MitraClip device. Med Devices (Auckl) 2016;9:53-60. Falk V, Seeburger J, Czesla M, Borger MA, Willige J, Kuntze T, et al. How does the use of polytetrafluoroethylene neochordae for posterior mitral valve prolapse (loop technique) compare with leaflet resection? A prospective randomized trial. J Thorac Cardiovasc Surg 2008;136:1205. Seeburger J, Falk V, Borger MA, Passage J, Walther T, Doll N, et al. Chordae replacement versus resection for repair of isolated posterior mitral leaflet prolapse: À ègalité. Ann Thorac Surg 2009;87:1715-20. Seeburger J, Borger MA, Doll N, Walther T, Passage J, Falk V, et al. Comparison of outcomes of minimally invasive mitral valve surgery for posterior, anterior and bileaflet prolapse. Eur J Cardiothorac Surg 2009;36:532-8. Yoo JS, Kim JB, Jung SH, Kim DH, Choo SJ, Chung CH, et al. Mitral durability after robotic mitral valve repair: Analysis of 200 consecutive mitral regurgitation repairs. J Thorac Cardiovasc Surg 2014;148:2773-9. Praz F, Spargias K, Chrissoheris M, Büllesfeld L, Nickenig G, Deuschl F, et al. Compassionate use of the PASCAL transcatheter mitral valve repair system for patients with severe mitral regurgitation: A multicentre, prospective, observational, first-in-man study. Lancet 2017;390:773-80.